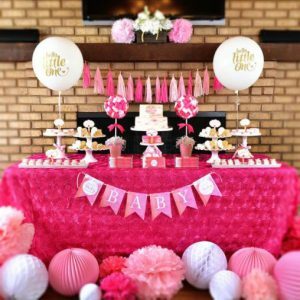 Whether it is your baby on the way, or a friend, relative or colleague’s baby, throwing a baby shower requires an element of organization for the event to have that excellent. 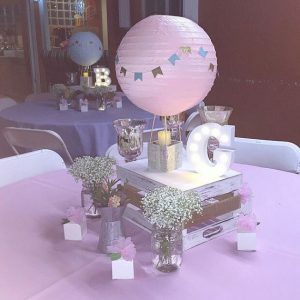 To get you inspired for the look and feel that can be easily recreated for a beautiful baby shower, check out our baby shower decoration ideas and throw a baby shower party that will be forever memorable for everyone. To create a ballerina tutu inspired baby shower decoration, you’ll need balloons, a draped tablecloth, and baby’s breath flowers with a beautiful tulle ribbon. 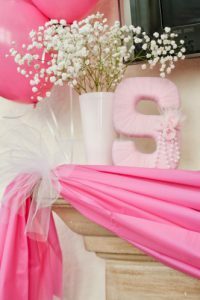 For an extra personal touch, liven up the baby shower entrance table by creating a 3-D tulle letter to represent baby’s name if known, that can later become a nursery gift. 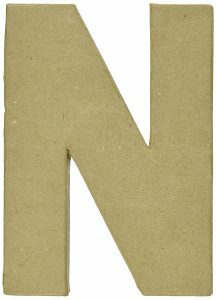 The letter can be made using paper mache and a spool of tulle wrapped around the letter. To make your guests feel lost at sea, try a nautical baby shower decorations. Dress up any indoor fortress or outdoor patio with knickknacks to achieve this. Baby shower decoration ideas for boys involve the blue color. A nautical decoration will bring a feel of the sea to the baby shower. This can be both for boy theme and girl theme. To decorate the room, make table decorations and party favors in navy blue with red colors and anchor accents. You can also make personalized nautical-themed place mats and candy. Use seaside centerpieces, hanging and colorful ceiling decorations. This classic color combination of navy blue, red, and cream will create a sea worthy tone for your baby shower. 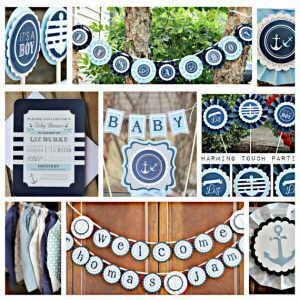 Here is my post on nautical theme baby shower ideas. Use pre-owned furniture you have at home and make the furniture a display case for this baby shower decoration idea. 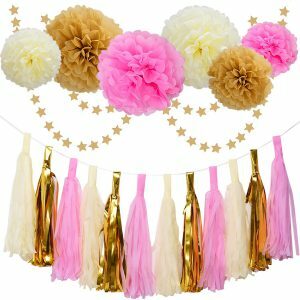 Hang a unique backdrop which can include a bunting and ribbon garland with a bookshelf. Use shelves from the case to display canvas pictures of the mom-to-be, and make it more eye-catching with some paper pompom flowers matching the shower’s color theme. Make a hot-air balloon decoration as a centerpiece to finish a table setting using a paper lantern attached to a mason jar with hot glue and lollipop sticks. Attach a string around the lantern and cover the neck of this jar with ribbon which is perfect for a baby shower. This are easy DIY baby shower centerpieces you can create or if you have no time you can buy. 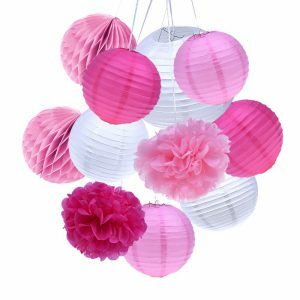 Another unique homemade baby shower decoration is to get your guests creative by making them make their own decorations. A unique idea is to make the guests paint a message on a white baby onesie (or bibs). This makes a fun and interesting baby shower activity and can also become a one-off gift for the baby-to-be. Materials needed to get creative include: fabric markers and paint, appliques to suit the theme or customized heat transfers. 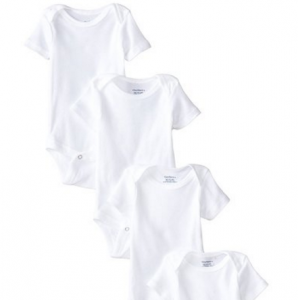 These painted onesies can then be hung on a line fixed on the ceiling as a decoration. Keep all the baby shower decorations in the same color tone and make it all matching. A dessert table can look fantastic, with ribbon topiaries, balloons, and a banner. 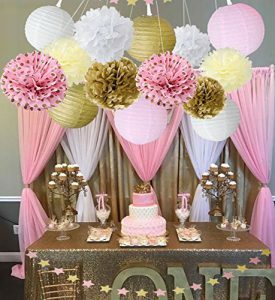 Tissue pompoms, honeycomb, tissue tassel garlands, and streamers can offset the overall dessert bar design to match the color theme perfectly. The desserts can also become part of the decor by matching frostings to the color theme and making printable candy wraps for a special touch. 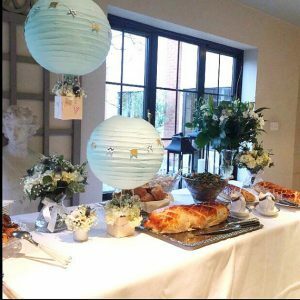 We hope you got some inspiration from the baby shower decoration ideas above for an amazing event to celebrate the coming new life. Click here for more baby shower decoration ideas. Have any ideas you wish to share? This entry was posted in DIY and tagged Decorations. 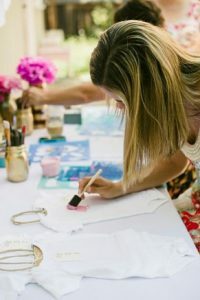 ← Unique Baby Shower Ideas to Wow your Party!